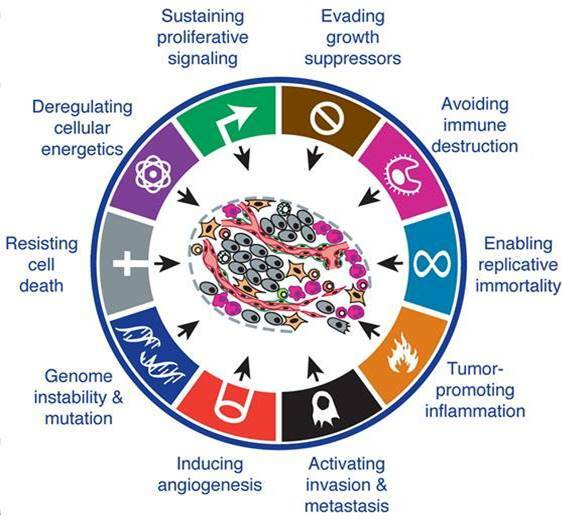 Cancers arising at any one location of the body are heterogeneous in nature, meaning that each tumor arises because of a different set of accumulated mutations and has different forms of DNA damage to its genome. ﻿Despite this being﻿ the case, the mutations affecting all tumors tend to arise in key cellular pathways, such as those that regulate cell growth or DNA maintenance (Fig. 1). In addition to changing the growth properties of the cells, cancer-causing mutations lead to the generation of altered proteins by neoplastic cells. A long standing question in the field of cancer research is why cells producing these altered proteins, which are akin to bacterial or viral pathogens, are not recognized as “foreign” by the body’s immune system and destroyed. Fig. 2. Stages in the immunoediting process. Nat Rev Immunol. 6, 836-848 (2006). A theory proposed to explain ineffective anti-tumor immune responses is known as the “Immunoediting Hypothesis” and suggests that the body’s immune response against a tumor progresses along three stages (Fig. 2). In the first stage, known as “Elimination”, the body’s immune system effectively recognizes newly formed cancer cells as foreign entities and effectively destroys them, preventing cancer development. In the second stage, known as “Equilibrium”, the immune system recognizes and destroys most but not all cancer cells. The immunologically resistant cancer cells continue to reside with body but there is no development of a clinically detectable tumor because most of the neoplastic cells continue to be destroyed. In the final stage, known as “Escape”, the cancer cells are completely resistant to attack by the body’s immune system and the tumor grows to a size where it causes clinical disease. While no one knows how long each of these stages lasts, the theory of immunoediting is consistent with cancer being largely a disease affecting the elderly. Fig. 3. 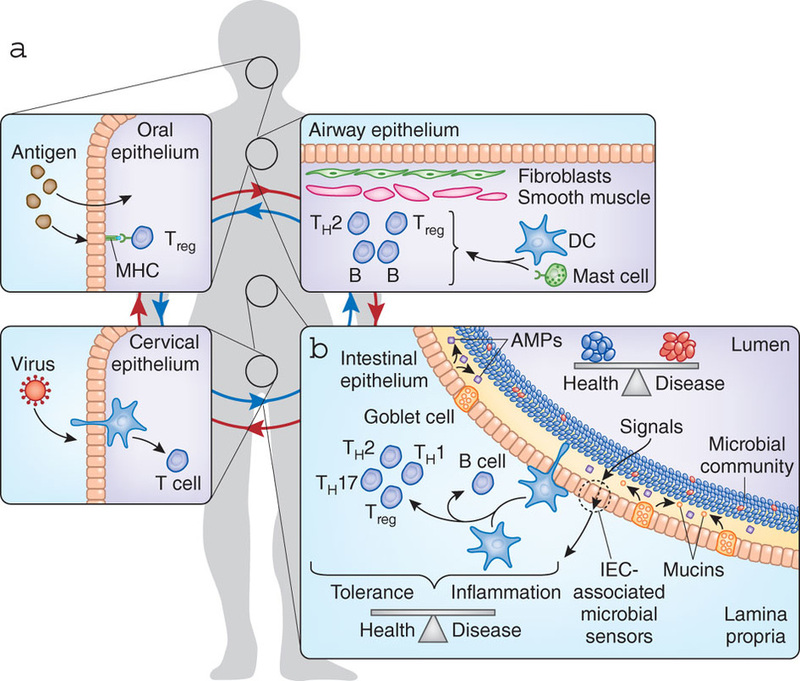 The mucosal immune system. Nat Immunol. 11, 558-560 (2010). The intestine contains a very specialized branch of the immune system whose function is to monitor all of the foreign material that we ingest, including the food we eat and the normal bacteria that reside in the intestine and help us digest this food (Fig. 3). In contrast to the immune system in the rest of the body, which is protected from exposure to foreign material under normal circumstances, cells in the mucosal immune system exist in the constant presence of foreign entities. In order to prevent conditions such as food allergies from affecting all of us, the mucosal immune has developed numerous regulatory mechanisms that lead to a state of “tolerance” to large amounts of foreign material. While this tolerance is an extremely important adaptive measure to prevent hyperreactivity, it is believed to make the intestine more susceptible than other organs to the development of cancer because the local immune system is even less likely to react to altered tumor proteins (“neoantigens”) than immune cells elsewhere in the body. The research conducted in our lab attempts to shed light on the immunological arms race between a cancer and the immune system. Specifically, we focus on colorectal cancer (CRC) and the mucosal immune system because we think that this represents an excellent model for understanding some of the mechanisms by which tumors escape immune detection. The predominant type of mutational process in most CRC is the rearrangement of chromosomes, leading to cancers that are characterized by chromosomal instability (CIN CRC). A subset of roughly 15% of sporadic CRC are characterized instead by high levels of microsatellite instability (MSI-H CRC) which is caused by the appearance of many different point mutations in the genome due to a failure of DNA mismatch repair mechanisms. MSI-H CRC thus generate a far greater number of altered proteins because of their unstable genomes and are thus thought to be more immunogenic. This is consistent with the fact that larger numbers of immune cells, especially CD8+ T cells, are present in tumors that are MSI-H and that patients with these tumors tend to have a better prognosis than other patients. 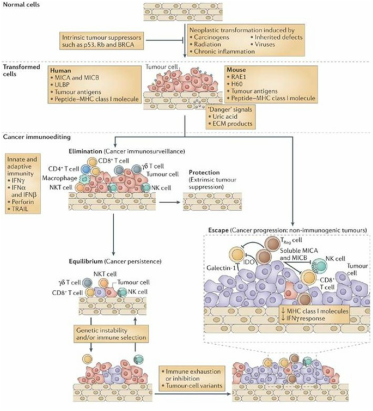 By studying the mechanisms through which MSI-H CRC interact with the mucosal immune system, we hope to learn important information that can be translated into treatments for other types of CRC as well as other cancers. We believe this is possible because many factors contribute to the development of mutations in a cancer and some of these represent very good targets for therapeutic intervention because they will increase the ability of the immune system to recognize cancer cells as foreign. 1. The inherent mutational profile of a tumor. What kinds of immune responses are associated with disruptions to different DNA repair pathways that lead to different patterns of genomic instability? How can the immune responses associated with specific types of genomic instability be therapeutically altered to increase killing of cancer cells? 2. The production of DNA altering products by intestinal bacteria known as the “microbiota”. How do metabolites and genotoxic substances produced by resident intestinal microbial populations alter a tumor’s antigenicity? What microbial factors can increase anti-tumor immune responses? Are different kinds of microbial species associated with CIN and MSI-H CRC? 3. The effects of different therapeutic interventions that target tumor DNA. How does DNA-damaging chemotherapy influence anti-tumor immunity? How do the DNA repair processes activated by radiation therapy contribute to the production and release of tumor neoantigens? Why does treatment of CRC patients with new forms of immunotherapy have a very low efficacy compared to patients with cancers at other sites? Through the use of techniques such as cell culture, DNA sequencing, RNA and protein analysis, flow cytometry and live tumor imaging in rodent cancer models, our lab aims to answer questions such as these about how colorectal tumors effectively avoid immune detection. This work will give the cancer community a better understanding of how cancers develop in the context of a complex microenvironment containing immune cells and microbial agents. Our research will thus contribute to the development of new drug and therapeutic strategies for the treatment of CRC and help us identify new ways to stimulate the body’s natural defense system to kill cancer cells.